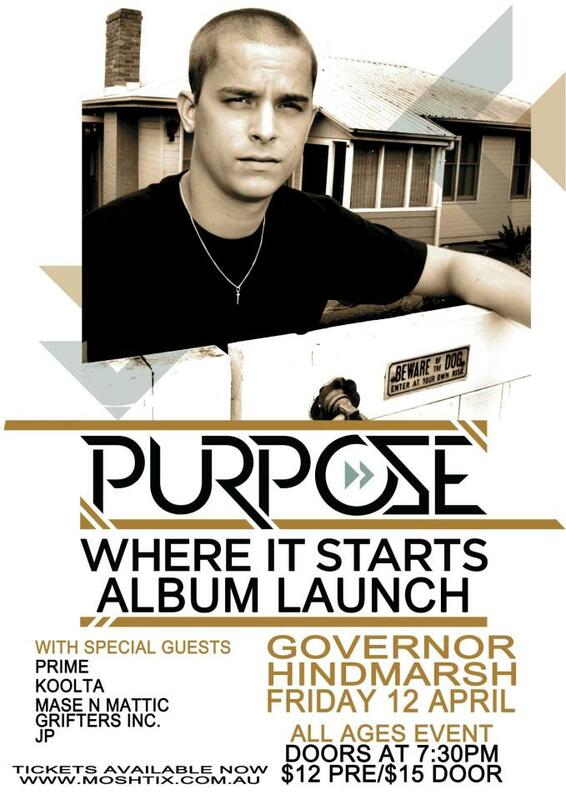 Adelaide get down The Gov tonight for Purpose’s Where It Starts album launch. Tonight he unveils his new live show in what is shaping up to be a big night for independent Australian music. Tickets are still available, get em’ by following the link below. Special guests include Prime, Koolta, Mase N Mattic, Grifters Inc. and JP & DJ Sanchez. Doors open at 7.30pm, $12 per/$15 at door. Get your tickets here. Purpose recently performed at the Clipsal 500 alongside Drapht, Hilltop Hoods, Pez and more. Purpose will be launching his album in Melbourne tomorrow night, so get down to the Laundry Bar if you’re around.